Portable Air Compressor Market size will surpass USD 9 billion by 2024; according to a new research report by Global Market Insights, Inc.
Portable air compressor market is driven by its superior and handy features such as compact design, extreme portability and light weight. These portable machines are hand-carried, wheel or utility mounted and stand available in various characteristics such as single stages, multi stages, oil-injected, etc. Rising use of these machines in the mining and oil & gas sectors will drive the portable air compressor market, especially in the Asia Pacific region. With strong history in industrial and manufacturing activities, Asia Pacific, has also grown increasingly in the construction industry. Most of the electric tools used are operated using compressed air. Increasing residential and commercial construction activities driven by increasing population and infrastructural development will foster the portable air compressor market in the coming days. Many government agencies are setting up mandatory frameworks and ecological requirements for industrial equipment with regards to greenhouse gas emissions from compressors which are major sources of air pollution. One such example is the European Union’s mandatory framework for any energy using industrial equipment, which is responsible for greenhouse emissions. These regulations have resulted in the development of energy-efficient compressors with better pollution-control mechanisms. The higher costs of these newly developed movable machines, is likely to negatively affect the portable air compressor market growth during the forecast timeframe. Reciprocating, rotary, and centrifugal are the three major segments in which the portable air compressor market has been segmented. The rotary segment is further bifurcated into scroll, screw, root blower, vane, etc. Oil flooded and oil free are the two major segments by lubrication for the portable air compressor market. Owing to huge industrial and heavy-duty activities in the oil & gas, mining, quarrying, and construction works, oil injected air compressor market is said to hold larger volume share. The segment will be valued over USD 6.5 billion by 2024 by exhibiting a decent growth in the forecast period. Healthcare, manufacturing, semiconductors & electronics, mining & quarrying, oil & gas, food & beverages, and building & construction are some of the end-user industries where portable air compressors find applications. Growing healthcare needs round the world coupled with use of extreme portable air compressors will boost the industry in the future years. Considering volume, the segment is said to hold close to 20% market share by 2024. 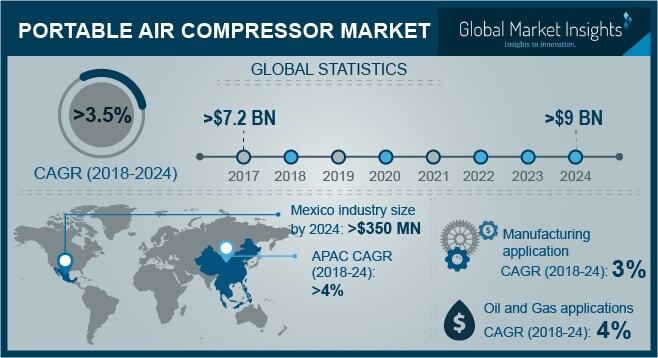 Huge manufacturing activities in the Asia Pacific region led by China, and Latin America, led by Mexico will boost the portable air compressor market in the next six years. China manufacturing application is said to surpass USD 1.3 billion by the end of 2024 with a CAGR of around 3.5%. Mexico portable air compressor market will surpass USD 350 million by the end of the 2024. Portable air compressor market is fragmented and has a number of players present in it. Some of the companies include Gardner Denver, Vanair Manufacturing, Mat Holdings, Elgi Compressors, Quincy Compressor, Doosan Portable Power, Atlas Copco, Belaire Compressors Hubei Teweite Power Technology Company, Sullivan-Palatek, Ciasons Industrial, Kaeser Kompressoren, Ingersoll-Rand, Rolair Systems, and Sullair to name a few.